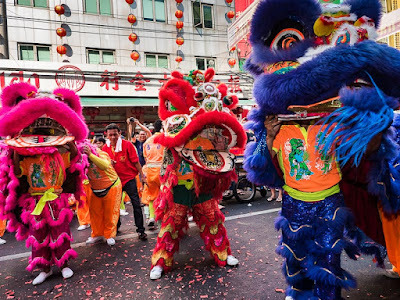 Lion dancers perform on Yaowarat Road in the heart of Bangkok's Chinatown during the kickoff celebration of Chinese New Year. This is the Year of the Monkey. 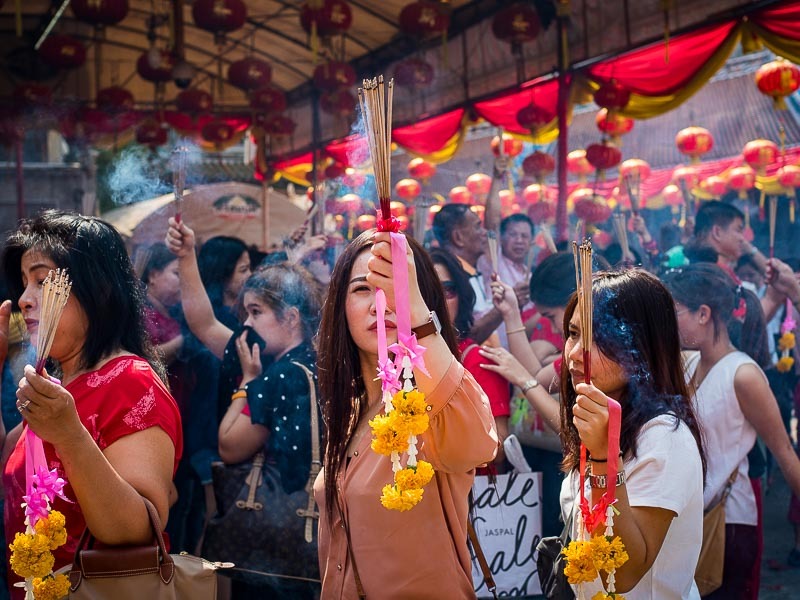 Thailand celebrated its second New Year's Day with gusto this week as thousands of people jammed into Bangkok's Chinatown neighborhood to celebrate the Chinese New Year. Millions of Chinese have emigrated to Thailand through the centuries. By some estimates as many as 14% of Thais are Thai-Chinese or have Chinese ancestors in their family tree. Chinese New Year (or Lunar New Year, also called Tet in Vietnamese communities) is a big deal here. People think of Lunar New Year as a raucous party with fireworks and lion dances, but there is an important religious component to the holiday (and the truth is the fireworks and lion dances are religious). 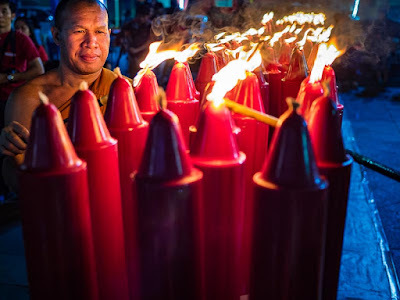 Monks at Wat Traimit start the holiday by lighting candles in the courtyard in front of the temple. 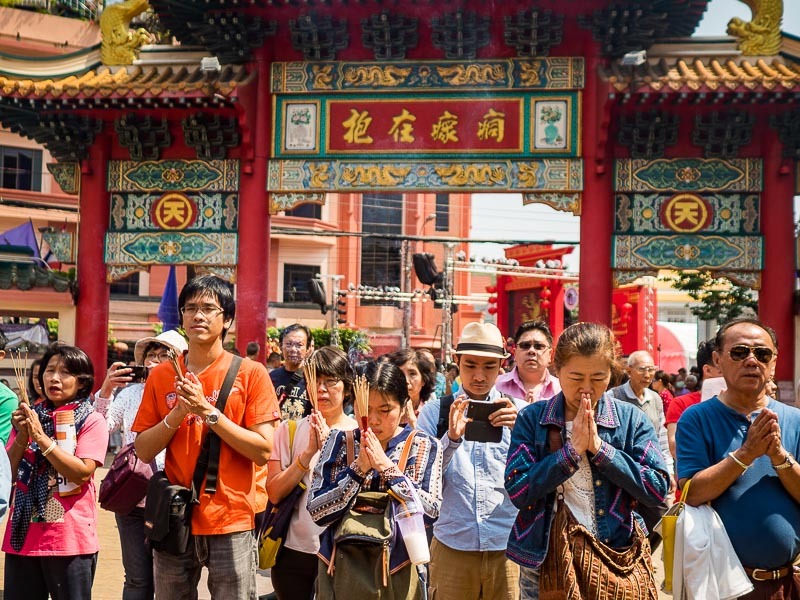 People gather to pray at Kuan Yim Shrine in Chinatown. 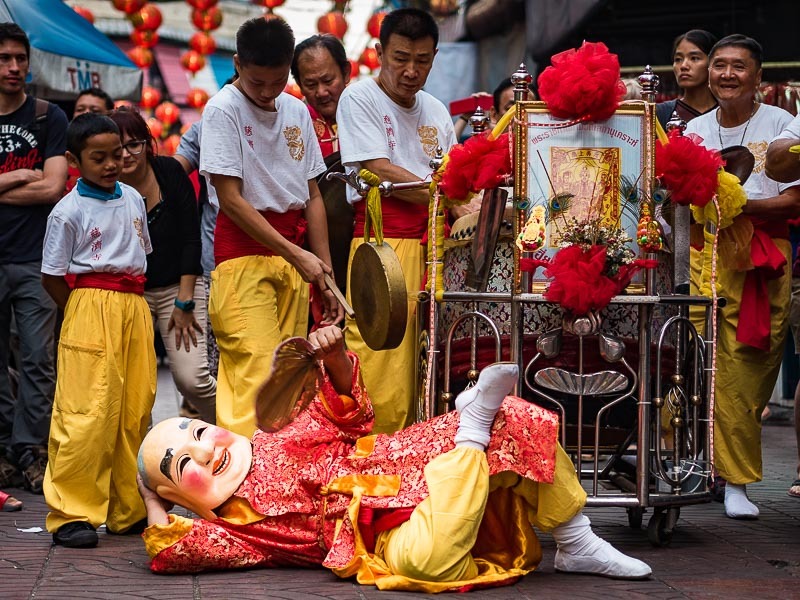 Although Lunar New Year is an important event on the tourism calender, it's not a creation of tourism authorities. Hundreds of thousands of Thais flock to temples to make merit and pray for a prosperous new year. Bus and train stations are packed with people going to their home provinces to spend the day with family. While the it's not a legal holiday in Thailand, so many people take the day off that rush hours are (a little) less congested. 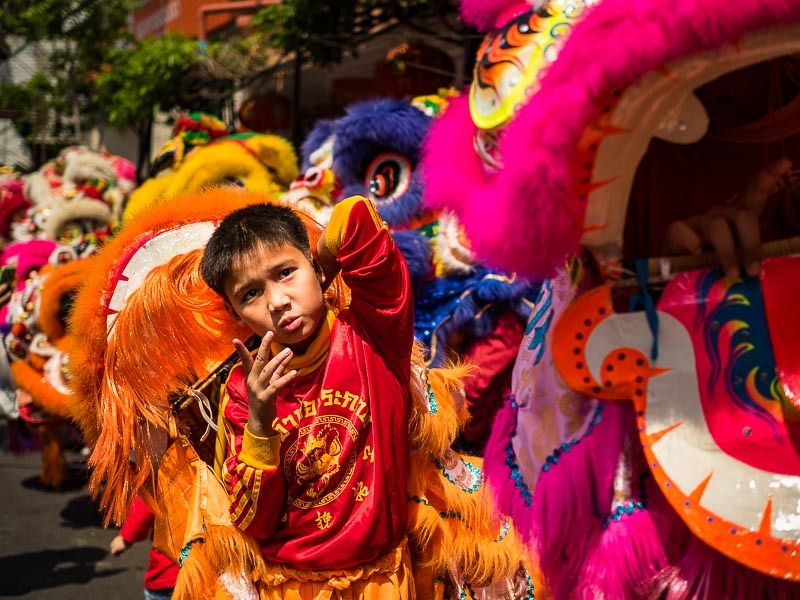 A boy in a lion dance troupe waits for the lion dance parade to start. 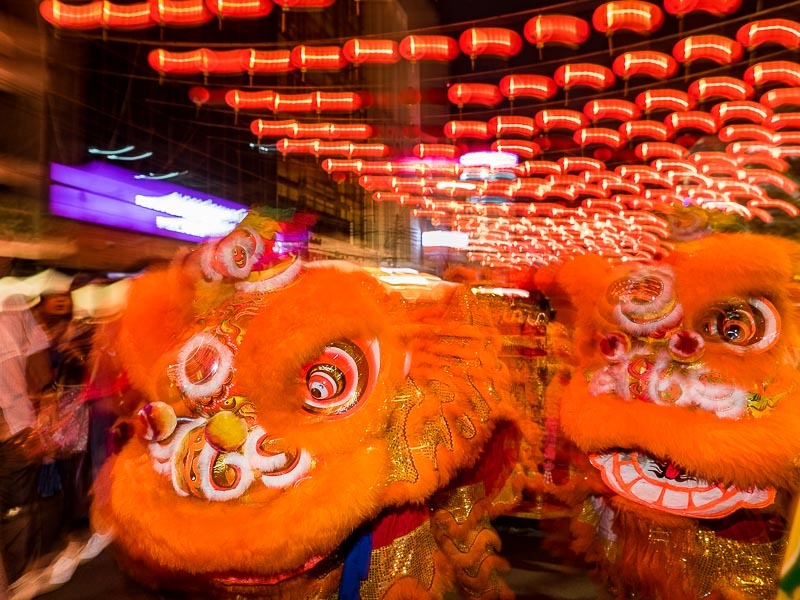 Lion dance troupes go through Chinatown performing in shops to bring good luck and a prosperous new year. The owners present cash offerings to the dancers. I never tire of the excitement of Lunar New Year in Bangkok. If you look, you can see much of the Thai-Chinese experience in a few city blocks. There's the touristy experience on Yaowarat Road, the spiritual experience in the temples and shrines and Chinese opera (which I didn't photograph this year). 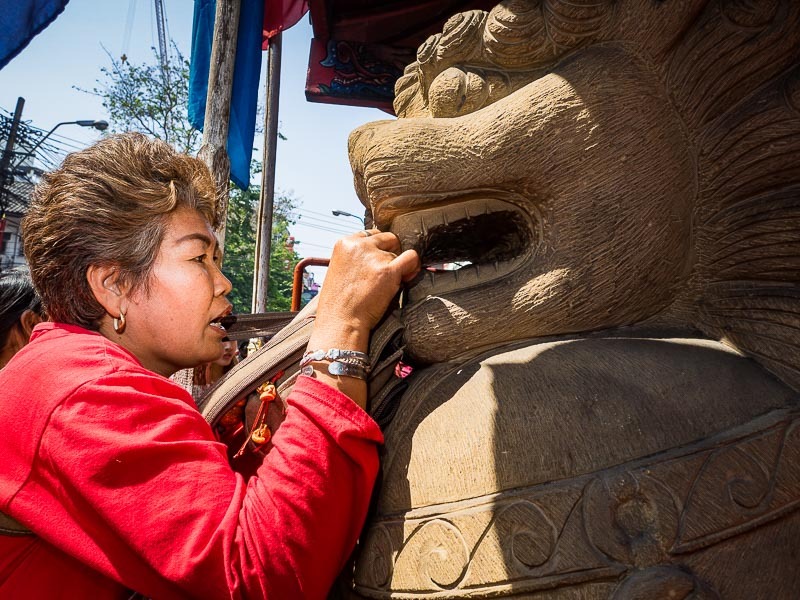 A woman prays for a prosperous New Year at the lions that guard Wat Mangon Kamlawat, the largest Mahayana Buddhist temple in Chinatown. People hold lit incense sticks over their heads while they wait to go into the prayer hall at Wat Mangon Kamlawat to pray. This year I ended up spending four days in Chinatown photographing preparations for Lunar New Year and the actual New Year's Day. I've had the privilege of photographing Lunar New Year festivities in a lot of places - New York City's is fun but February in New York is seldom pleasant. (Sorry New Yorkers.) Lunar New Year in Phoenix is mostly a chance to go to a Chinese restaurant and have Americanized Chinese food. But Lunar New Year in Bangkok is as close to the authentic experience as I've come yet. Maybe next year I'll go to Hong Kong. A member of a dance troupe performs in an alley in Chinatown. Thailand celebrates New Year's three times. January 1 is the official Thai New Year and has been since the 1930s. Lunar New Year is widely celebrated in the Thai-Chinese community and Songkran, the traditional Thai New Year is celebrated in April (it's also celebrated, albeit with a different name, in Theravada Buddhist countries bordering Thailand, like Cambodia, Laos and Myanmar). There are many more photos of Lunar New Year in my archive.